Valsavarenche is one of many “finger” valleys extending into the high Alps from the Vallée d’Aoste. It is part of the huge and beautiful Parco Nazionale Gran Paradiso. 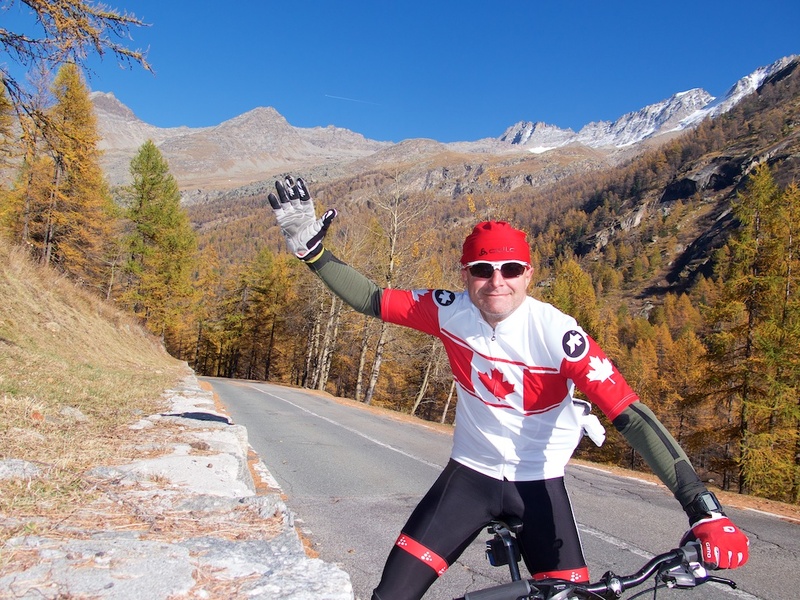 It is also the back way down from Colle del Nivolet – maybe (maybe!) my favourite climb anywhere. I wanted to see if it was possible to get up to Nivolet from here. 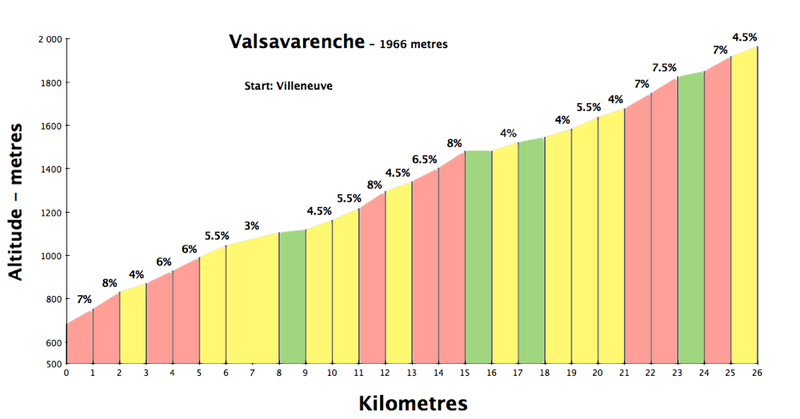 It’s a 26 kilometre climb that is rarely too steep. The road is quiet, wide, and well surfaced. Not too many hairpins as the ride relentless heads straight into the Graian Alps. 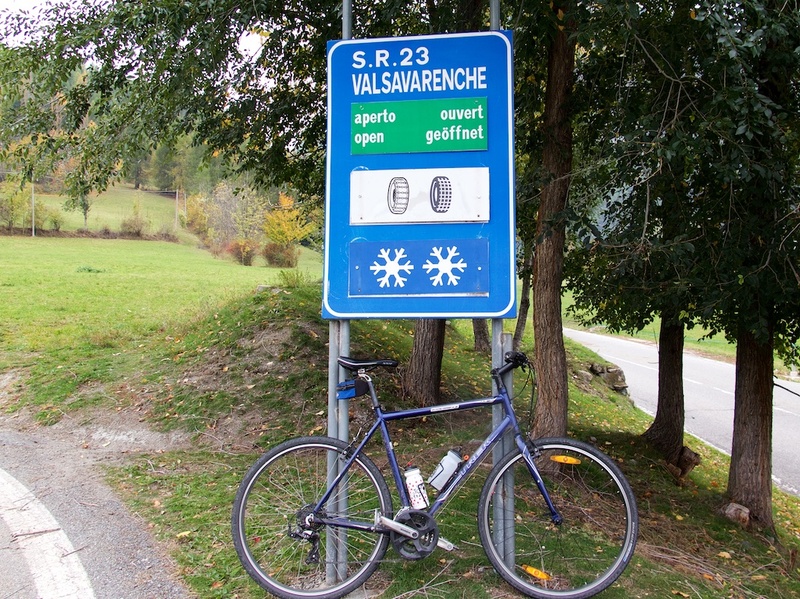 I used a hybrid, as I hoped to make it to Nivolet, but this climb to Pont is entirely paved. Autumn in the Alps means the Larch are changing colours. And I was excited to wear my new Canada kit! The paved road ends at 1966 metres at Pont. One can continue for a little on a gravel road through a plateau where there is cross country skiing in winter. But I was disappointed to see that it was ridiculous to expect to get to Col delle Nivolet high above without carrying the bike most of the way. Basically, the road ends and there is a steep, rocky hiking trail. I took it for a while, but in late October, the north facing trail was already dark, and the adventure made no sense. Oh well. Thanks for this nice route description! I have a question about this trail from Pont up to Nivolet: given some time, how would it be to push a loaded bike up the path? 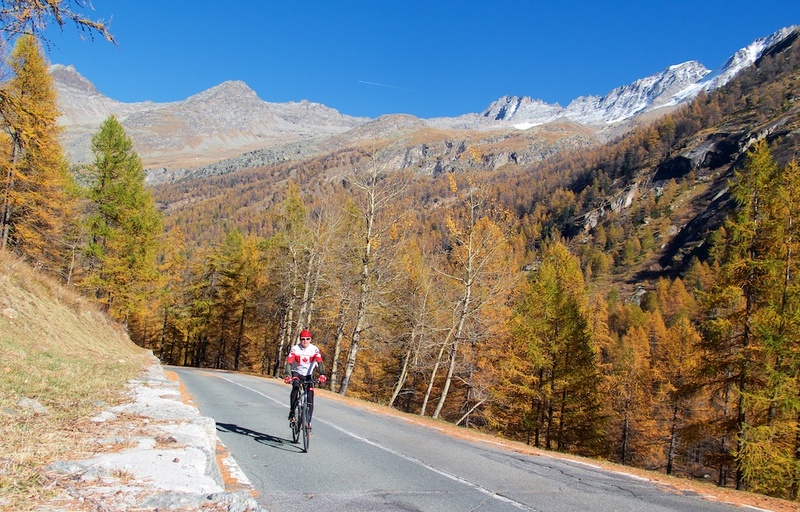 I would like to do the traverse North-South and then cycle down the pass road, and from the satellite images it looks like the road is easy as soon as you reach the valley, but it’s difficult to know how the trail is just above Pont (between 2000 and 2300m of altitude). It’s a steep hiking trail. But I think do-able. Not dangerous, just quite hard work. Hi again Will, further to other message trail, how long would the walk be on the trail from Pont? Just road bike and running shoes? John, I am not exactly sure. I do know that the official French IGN maps for there are very misleading, and incorrectly hint at a road lower down. I think it’s a couple of very steep kilometres then a little less crazy? You have to get from 1966 metres to over 2600m but the last few kms are a “road.” I don’t think it’s much more than 6 kms as the crow flies. But you might want to try and get a local Aosta map. I then went there during a one-week biking trip and walked from Pont to the Colle del Nivolet, with a road bike and a trailer containing all my stuff (camping and equipment). I believe it took me a good three hours before I could be riding again. I think if you have only the bike, and if you are reasonably fit, you can do the first part (steep or very steep) in about an hour and the second (flatter, but it’s not a good path, so you can’t ride much with a road bike) also in less than an hour!